The Chicken Dance fulfills two important criteria for the growing piano player: it is good for the development of your piano skills and it is fun to play. It qualifies as a mid-elementary level piece because it is a simple melody above some basic chords. Yet, it challenges the elementary level pianist in that it requires quite a bit of coordination between the hands. This is an excellent first "ragtime" piece for those very reasons. Anyone wanting to eventually have the ability to play the music of Scott Joplin, William Bolcom, or any other ragtime or stride piano composers, will benefit by playing the Chicken Dance along with many more pieces of similar texture and level. 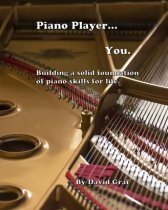 By playing a few ragtime-style pieces at every level along the way, you will be gradually building a foundation of skills specifically designed to prepare you for the greater, bigger, more advanced ragtime piano pieces coming later on in your piano journey. 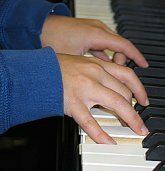 This particular arrangement offers an excellent exercise for working on your "learning & memorizing" skills at the piano. The music breaks easily into 4-measure phrases. Thus, it is perfect for working in 2 & 4-measure links. The left hand part consists of two simple chords (the I & the V7) to be played in the most basic "ragtime" pattern. The right hand part is just the melody, or tune, for the dance. But combining the two of them will challenge any pianist who may be new at this type of texture. So, take it very slow. Especially when you first put the hands together on each 2-measure link. Be patient as your hands and your mind learn how to coordinate the movements and the meshing of the two rhythms. The more you practice, the easier it will get. But only if you keep it slow for quite awhile. In the video, as usual, you will see me playing things a bit faster than you should be going. If I took everything at the super slow tempos needed for the beginning stages of learning a piano piece, the video would be excessively long. So take your time. Pause the video and play each part very slow, repeating it until you have it mastered. Then... keep moving. Good luck... and have fun!